Ayn al-Asad Airbase (IATA: IQA, ICAO: ORAA) is an Iraqi Armed Forces and United States armed forces base located in the Al Anbar Governorate (also called Anbar province) of western Iraq. The base is also used by UK forces in Iraq. It was the second largest US military airbase in Iraq during Operation Iraqi Freedom. Until January 2010, it was the home of the II Marine Expeditionary Force/Multi-National Force West. Other major tenants have included the 3rd ID's 4th IBCT, 82nd Airborne Division Advise & Assist Brigade, 332nd Medical Brigade, 321st Sustainment Brigade, Vertical Onboard Delivery Detachment-1 (VOD-1), VAQ-142, Navy Customs Battalion Juliet, elements of the Iraqi Army's 7th Division, and the United States Air Force (USAF). Previously, due to numerous amenities aboard the base, service members referred to it as "Camp Cupcake", despite the danger being very real and the base being the first line of defense against ISIS in following years. As of late 2017, all amenities have been eliminated. One food option remains, which is the Chow Hall. The base is located in the Hīt District of the largely Sunni Al Anbar Governorate, about 100 miles (160 km) west of Baghdad and 5 miles (8.0 km) west of the village of Khan al Baghdadi. The airbase is divided by Wādī al Asadī (وادي الاسدي), a wadi whose course passes through the oasis along the base's western edge and then continues eastward, emptying into the Euphrates River at Khan al Baghdadi. This oasis is locally referred to as "Abraham's Well". The ‘Ayn al Asad spring surfaces within the base and flows into the Wādī al Asadī. Geologically, the base resides in the Al-Ḥammād sector of the Syrian Desert, composed mostly of a rock and gravel steppe. The base was originally named Qadisiyah Airbase (قاعدة القادسية الجوية), a reference to the Battle of al-Qādisiyyah (c. 636). Qadisiyah AB was one of five new air bases built in Iraq as part of their Project "Super-Base", launched in 1975 as a response to the lessons learned during the Arab-Israeli wars of 1967 and 1973. The base was built sometime between 1981 and 1987 by a consortium of Yugoslavian companies under contract to the government of Iraq. Two Yugoslav government agencies led the project. The FDSP (Federal Directorate of Supply and Procurement) acted as the project manager and Aeroengineering acted as the project engineer. Known as 'Project 202-B' and 'Project 1100', the companies involved in its construction included Granit, Vranica d.d. Sarajevo, I.L. Lavčević d.d. Split, and Unioninvest d.d. Sarajevo. The US$280,000,000 project at Qadisiyah AB included accommodation for 5,000 personnel and the necessary infrastructure including public facilities (mosques, outdoor and indoor Olympic swimming pool, football field, sports hall, cinema, library, elementary school, high school, hospital and clinic) and fortified military facilities (military airport, shelters for personnel and equipment, shelters for bombers and fighters and military barracks). The hardened aircraft shelters built here and throughout Iraq by the Yugoslavs were nicknamed 'Yugos'. At the time they were considered state of the art but were rendered obsolete in 1991 after the development of the GBU-28 laser-guided bunker-buster bomb. Prior to the 2003 invasion of Iraq, the base housed three units of the Iraqi Air Force, which flew MiG-25s and MiG-21s. It was abandoned shortly after the start of the invasion. It was initially known as Objective Webster, and then eventually was renamed Al Asad Airbase, which means "The Lion" in Arabic. The base was initially secured during the Iraq War by the Australian Special Air Service Regiment on 16 April 2003 and was turned over to the 3rd Armored Cavalry Regiment (3rd ACR) in May 2003. The 3rd ACR was relieved by the Marines of the 1st Marine Expeditionary Force in March 2004. Al Asad became the largest U.S. base in western Iraq and the western equivalent of Baghdad's Green Zone. Al Asad was a major convoy hub, hosting hundreds of fuel and supply trucks every day. Huge shipments of fuel were commonly run along the dangerous routes coming out of Jordan and, despite insurgent attempts, a majority of these convoys arrived at their destinations untouched. A single convoy operation would sometimes last a couple days with trucks on the road for over 8 hours a day. The controversial song Hadji Girl was recorded at Al Asad in 2005. On September 3, 2007, President George W. Bush, Secretary of State Condoleezza Rice, Secretary of Defense Robert Gates, and Chairman of the Joint Chiefs of Staff General Peter Pace visited Al Asad and spent Labor Day with the servicemembers deployed to the base. As the Marines withdrew from Iraq, Al Asad remained one of the last American-occupied bases in Al Anbar. In 2009 and 2010, Marines with the 2nd MEF removed the majority of gear and personnel from the base. The MEF concluded its operations at Al Asad in March 2010. The last of the civilian personnel were airlifted from Al Asad on December 16, 2011, and the base officially closed on December 31, 2011. VMFA(AW)-242 (F/A-18D) between August 2004 and January 2005. VMFA(AW)-224 (F/A-18D) between January and August 2005. VMFA(AW)-332 (F/A-18D) between August 2005 and February 2006. VMFA(AW)-533 (F/A-18D) between February and August 2006. VMFA(AW)-242 (F/A-18D) between August 2006 and February 2007. VMFA(AW)-121 (F/A-18D) between February and August 2007. VMFA(AW)-225 (F/A-18D) between August 2007 and March 2008. 327th_Signal_Battalion_(United_States) (Company A) between February 2005 and July 2005. In late October 2014, the airbase and surrounding region came under repeated attack by Islamic State (ISIL) militants. Fifty U.S. advisers were sent to the base. Also to conduct a site survey for U.S. advisers can use the installation to support the Iraqi military, said Navy Cmdr. Elissa Smith, a Defense Department spokeswoman. It now hosts 320 advisers. During the early morning hours of 14 December 2014, U.S. Marines hosted there allegedly clashed with ISIL alongside the Iraqi Army and Tribal Forces near Ein al-Asad base, west of Anbar, in an attempt to repel them from the base of which includes about 100 U.S. advisers in it at the time, when ISIL attempted to overrun the base. 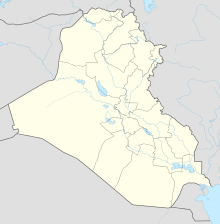 According to a field commander of the Iraqi Army in Anbar province, said that "the U.S. force equipped with light and medium weapons, supported by F-18, was able to inflict casualties against fighters of ISIL organization, and forced them to retreat from the al-Dolab area, which lies 10 kilometers from Ain al-Assad base." Sheikh Mahmud Nimrawi, a prominent tribal leader in the region, added that "U.S. forces intervened because of ISIL started to come near the base, which they are stationed in so out of self-defense," he responded, welcoming the U.S. intervention, and saying "which I hope will not be the last." This was said to be the first encounter between the United States and the Islamic State, in four years. However, this claim has been stated to be "false" by the Pentagon. The airbase and surrounding region came under repeated attack by Islamic State militants in October 2014. An Iraqi squad leader assigns a soldier his area of responsibility during defense training aboard Al Asad Air Base, Iraq, Feb. 8, 2015. The training gave the soldiers a greater understanding of basic ambush and defense maneuvers. On January 5, 2015 the Pentagon acknowledged that ISIL has been ineffectively mortaring the base. On February 6–7, U.S. Marines and Danish soldiers with Task Force Al Asad taught Iraqi soldiers basic defense and ambush techniques. In February 2015, ISIL took control of most of the town of al-Baghdadi which is close to Al Asad Airbase and began what a Defense Department spokeswoman called "ineffective indirect fire" against Al Asad base. Later, according to CBS News, "Eight suicide bombers managed [on February 13] to get onto [Al Asad] ... but were killed by an ISF counter attack almost immediately." Further, CBS news reported that "ISIL [had] been regularly shelling Ain al-Assad for the past couple days, but there have been no reports of damage from the shelling or the attempted bombing on Friday." In early March, Iraqi forces cleared ISIL out of al-Baghdadi. The airbase continues to be used by coalition forces in Iraq, including UK troops. In 2016 it was announced that the UK would send 250 more troops to be stationed at Al Asad base. In February 2018, it was announced that Capt Dean Sprouting had been killed at the base, possibly as a result of an accident. The Captain had been serving with the Black Watch, 3rd Battalion, Royal Regiment of Scotland. Wikimedia Commons has media related to Al Asad Airbase. ^ a b "Airline and Airport Code Search". IATA. Retrieved 19 November 2015. ^ Tilghman, Andrew (September 29, 2016). "The U.S. military is still whacking moles in Iraq's Anbar province". MilitaryTimes. Retrieved September 30, 2016. ^ a b "SP-MAGTF Commander Details ISIL Strikes; Notes 1st Marines 'Could Clear'". Breaking Defense. Breaking Media. Retrieved 7 February 2016. ^ Cooper, Tom (26 September 2003). "Iraqi Super-Bases (Samarah East AB section)". Arabian Peninsula & Persian Gulf Database. Air Combat Information Group. Retrieved 14 December 2013. ^ a b c "Katalog - Lista referensi Vranica d.d. 2009. - Eng" (PDF). Sarajevo, Bosnia-Herzegovina: Vranica d.d. Sarajevo: 4. Archived from the original (PDF) on 15 December 2013. Retrieved 26 March 2014. ^ "History and Organization". Granit. Archived from the original on 30 April 2011. Retrieved 14 December 2013. ^ "Granit company profile" (PDF). Skopje, Macedonia: Granit: 5. Archived from the original (PDF) on 16 December 2011. Retrieved 14 December 2013. ^ "History". Unioninvest. Archived from the original on 18 January 2015. Retrieved 14 December 2013. ^ Pike, John E. (26 September 2003). "Al Asad Airfield [Qadisiyah Airbase]". GlobalSecurity.org. Retrieved 14 December 2013. ^ "Australians in Iraq 2003 | Australian War Memorial". awm.gov.au. Retrieved 7 February 2016. ^ Murray, Cpl Meg (December 12, 2009). "Deployed embark Marines master tricky logistical limbo in Iraq". Multi-National Force West. United States Marine Corps. Archived from the original on 4 June 2011. Retrieved 6 January 2010. ^ a b c d e f g AirForces Monthly. Stamford, Lincolnshire, England: Key Publishing Ltd. November 2016. p. 43. ^ a b c d e f g Nordeen, Lon (2013). AV-8B Harrier II Units of Operation Iraqi Freedom I-VI. Bloomsbury Publishing. p. 92. ISBN 1780963114. ^ "U.S. troops under mortar fire in Iraq". militarytimes.com. Retrieved 7 February 2016. ^ a b "ISIS Fires Mortars Near Marines Deployed to Train Iraq Forces | Military.com". military.com. Retrieved 7 February 2016. ^ a b c "IS militants pushed out of village near Marine base". marinecorpstimes.com. Retrieved 7 February 2016. ^ "Danmarks bidrag til støtte i kampen mod ISIL". www2.forsvaret.dk. Retrieved 7 February 2016. ^ a b "Islamic State seizes Hit, assaults Iraqi military headquarters in Anbar | The Long War Journal". longwarjournal.org. Retrieved 7 February 2016. ^ a b "National Iraqi News Agency - NINA". Archived from the original on 2014-10-05. Retrieved 7 February 2016. ^ "Hundreds of US troops now deployed in Iraq's Anbar province - Middle East - Stripes". stripes.com. Retrieved 7 February 2016. ^ Thompson, Mark (5 January 2015). "U.S. Troops Now Under 'Frequent' Attack at Iraqi Base". Time. ^ "Dig in; Iraqi soldiers conduct defense, ambush training > The Official United States Marine Corps Public Website > News Display". marines.mil. Retrieved 7 February 2016. ^ "Islamic State fighters seize western Iraqi town: officials". Reuters. 12 February 2015. ^ "ISIS on the doorstep? Fighters reportedly seize Iraqi town near base holding US Marines". Fox News. 12 February 2015. ^ "Suicide bombers get onto Iraq Ain al-Assad airbase where U.S. Marines based near ISIS positions". CBS News. 13 February 2015. ^ "UK sending 250 more troops to Iraq". BBC News. 2016-06-30. Retrieved 2018-12-30. ^ Farmer, Ben (2018-02-02). "British soldier dies on Iraqi base". The Telegraph. ISSN 0307-1235. Retrieved 2018-12-30. Airport information for ORAA at World Aero Data. Data current as of October 2006.